An untimely reboot of your navigation computer leaves you in search of your home world with limited energy reserves. In Amazing Discoveries In Outer Space or ADIOS, you explore solar systems in order to find the route to your home. A solar system is planets, asteroids, dust clouds and various objects orbiting a star. ADIOS generates solar systems procedurally. This means that every solar system that you discover will be unique. Thus, every game you play will be a new challenge. In ADIOS every object is dynamic. So every object large and small is actually dancing around the sun and is subject to gravity forces. This means that even planets can collide and be destroyed or knocked out of their orbit. But it is as dangerous as it is rare: Very. The ADIOS universe is completely seamless. You can enter and exit your ship wherever you feel like it. Exit to explore a planet, do a space walk or perform emergency repairs in planet orbit. ADIOS features accurate trajectories for every object in the solar system, most prominently your ship. Use the trajectory line tool to plot a course through the solar system. Utilize the gravity pull of stars or planets to conserve precious energy. Explore planets via your spaceship or on foot, it’s your choice. Planets feature day and night cycle. It affects planet surface temperature and the activity of the local wildlife. Watch your atmospheric entry speed. In the example above the velocity is generating a lot of heat. But it might have been worth it, the ship scanner revealed 600 points of star data. High temperatures can damage the astronaut and ship. Try to remember to stay cool. The ships’ thruster engine costs energy to use. Exit the ship and explore on foot to save some energy. But be careful, you will be exposed to lots of dangers. Discover artifacts that give your star data. They help you plot the course to the next solar system on your route to your home. Or perhaps you find some cargo that you can convert into energy. Asteroid belts are rocks and discoveries orbiting a sun. Every asteroid is individually simulated, a gentle push might make it come crashing down to a planet surface. In ADIOS asteroid belts are high risk, high reward. You can find abandoned space stations or satellites rich with energy and star data. But you risk damaging your ship among the chaotic floating rocks. Find aliens, artifacts, powerups, ships and astronauts as you explore the solar systems in ADIOS. Unexpected things can happen in this procedurally generated universe, I trust you remembered to park your ship at a safe spot? – Discover new M.A.D.s as you play and pick your favorite! 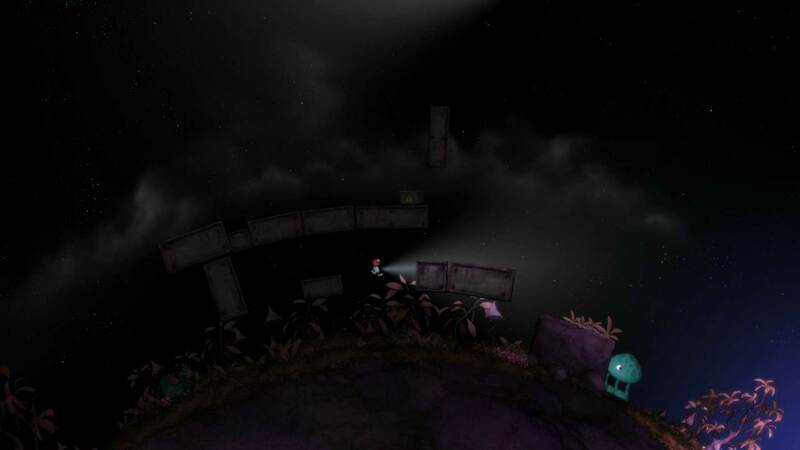 The flashlight is essential for exploring planets during night time. But you best leave hungry creatures to their sleep. Use the tow cable to tow around large objects. Let’s open up that hard to reach cave entrance. You can also drain energy from machinery with this multipurpose device. The jetpack can help you get out of tricky situations. It can help you during a space walk or when you need to have an extra boost when jumping. But it has a limited amount of energy so you will need to return to the ship to refill from time to time.